Not Getting Our Emails? - Afton Not Getting Our Emails? Help Center > Not Getting Our Emails? Are you an Afton member but somehow not receiving our emails? If so, here’s a quick checklist of what you can do to fix that! Often times, emails from us (and other actual important emails) get snagged by your spam checker. It happens to us all the time! You should make it a regular practice to check this folder at least weekly, for any important emails, either from us or otherwise. Once you've gone through that folder, it's always a good idea to clear that folder out so that you're at zero. Many of the major email clients, like Gmail, are now making use of different "tabs". Sometimes our emails do not go to spam, but instead to the MARKETING tab of Gmail and not your primary inbox. Just like the spam folder, it's a good idea to check your tabs regularly and clear out any junk messages that might be taking up space. Whitelisting is a term in the email industry for adding a subscribed contact or email to your address book. If we're not in your address book, add us! If you're using Gmail: -Log into your account and open up the email in your inbox. -Hover over the sender's name (in this case Afton) and a window will pop up. -Select "Add to Contacts" to save the sender to your Contacts list. -You can also whitelist in GMail before opening the email. -To do so, hover over the sender's name next to the subject line in the inbox. -Click "More" in the pop-up box. -Select "Add to senders" to save to your Contacts list. If you're using Yahoo: -Log into your account, hover over the "Settings" icon and click "Settings". -In the "Settings" tab, select "Filters" from the left menu and click the button to "Add" a filter. -Type a name for your filter in the "Filter name" field. -Select "contains" in the "sender" drop-down menu. -Type the sender's email address in the "sender" text field. -In the "Move to Folder" drop-down menu, select "Inbox". -Click the "Save" button in the top bar to save the filter. If you're using Hotmail: -In the upper right hand corner of your account, click on the "Settings" icon. -From here, click on the option for "Options". -While in this section, click on the option for "Safe and blocked senders". -Click on "Safe senders". -Enter in the sender's email address and click the button to "Add to list". If you're using AOL: -In the upper right hand corner of your account, click on "Options". -From there, click "Mail Settings". -On the "Settings" page, click "Spam Settings". -From there, choose "Allow mail only from addresses I specify" on the drop-down menu. -Enter in the sender's email address, click the plus button, and click save to save your changes. If you're using Outlook: -Right-click on the message in your inbox. Select "Junk E-mail" from the menu. -Then, click "Add Sender to Safe Senders List". If you're using Mac Mail: -Select "Mail" and "Preferences" from the top menu. -In the "Preferences" window, click the "Rules" icon. Then, click the "Add Rule" button. -In the "Rules" window, type a name for your rule in the "Description" field. Use the following settings: “If any of the following conditions are met: From Contains.” Type the sender’s email address in the text field beside “Contains.” -Select “Move Message” and “Inbox” from the drop-down menus. -Click “Ok” to save the rule. If you have NOT SEEN an email from AFTON for over a month - check above! We communicate with artists primarily by email when we offer tours, shows or send big announcements etc. You don't want to miss out on a big opportunity because you didn't check your email. 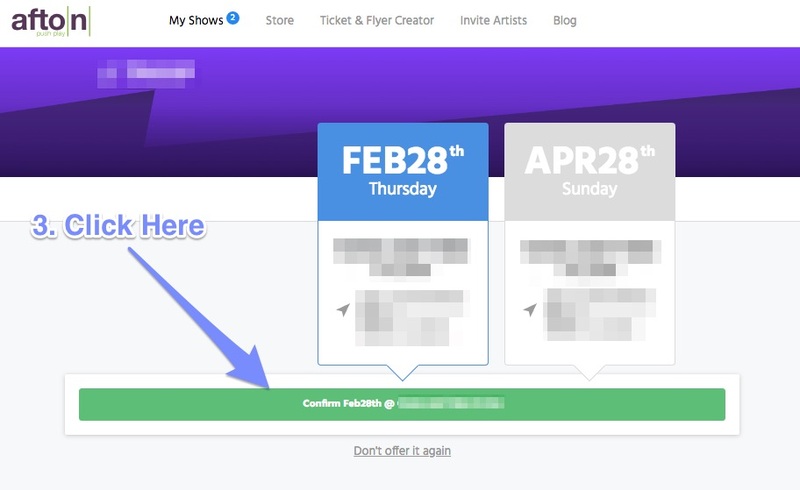 Remember: You can always Login to your MyAfton account to check your show status too!